Zdeno CHARA & Tuukka RASK. Boston Bruins. ANY INPERCTIONS YOU MAY SEE, ARE FROM THE TOP LOADER OR PENNY SLEEVE. ALL CARDS ARE IN MINT OR BETTER SHAPE, UNLESS OTHERWISE STATED . (CANADA & USA ONLY) Cards are sent in a plastic card protector. This is a rare 2018-19 O-Pee-Chee Tuukka Rask Retro parallel series card. It has always been very carefully handled. Tuukka RASK & Niklas BACKSTROM. 2010-11 Upper Deck SPX. "Winning Combos 2 Jersey Auto". (CANADA & USA ONLY) Cards are sent in a plastic card protector. ANY INPERCTIONS YOU MAY SEE, ARE FROM THE TOP LOADER OR PENNY SLEEVE. 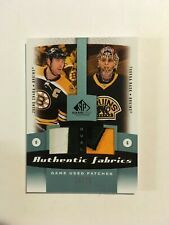 2018-19 ARTIFACTS DIVISIONAL ARTIFACTS #DA-TR TUUKKA RASK ! Check out the scan on this 2018-19 Synergy #LD-13 Tuukka Rask Last Line of Defense SHORT PRINTED INSERT card! Clouts'n'Chara is Canada's leader for hockey cards and group breaks. Opening their forums in 2008, they began offering a place for people to trade cards with each other, as well as selling hockey cards individually and through group breaks. As the business grew, Clouts'n'Chara attracted more customers and more business, eventually becoming incorporated in 2010. The business' ownership began discussing a physical location as the year progressed, and in September 2011, Clouts'n'Chara Inc. opened their first location in Kitchener, Ontario. Since then, the business has continued to steadily grow to the point it's at now, with almost 6000 dedicated members on their forums, and many in-store customers each week. 2011-12 Tuukka Rask Game Used Dual Jersey Card Bruins Black Diamond #BOS-TR The card you see is the card your getting. I'm sorry for the very poor case that it is in, only have the ones I received with these cards. The cards though are in exceptional shape. Please look closely at the pictures and grade it for yourself, however I would say this card is in excellent condition! I have a huge Red Wings card collection and quite a few Bruins cards and will be listing some of them over time. I would be able to do a better price on some by selling multiple cards together. Also selling other items and can ship together if your interested in anything, take a look! Feel free to ask any questions - Thanks for looking!